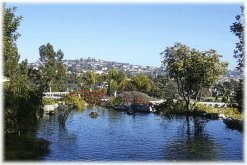 La Costa is a world famous resort and residential community that became a part of Carlsbad in 1972. It lies just east of the beautiful Batiquitos Lagoon. Residents and visitors to La Costa enjoy picturesque rolling hills, lush canyons and expansive views that stretch all the way to the Pacific Ocean. The La Costa Zip Code is 92009. Search MLS data for La Costa real estate & La Costa homes for sale. The modern La Costa story began in 1965, when a partner in the Desert Inn hotel in Las Vegas bought 3,500 acres of the scenic natural area. He developed a golf course and started selling La Costa real estate. The 90-room Rancho La Costa Inn was built to accommodate the visitors coming to look at these first home sites. Then, the Spa was added and ultimately, another 2,000 acres were purchased as the Inn grew in size. Ever since these humble beginnings, the rich and famous have been coming to what is now the celebrated La Costa Resort and Spa. Sports Shinko, a Japanese company, bought the Resort in 1987 at the peak of the real estate market for a record high price. Fourteen years later they sold the La Costa Spa to KSL, a California resort hotel group at a much lower price. Fast forward to 2007 when KSL sold it to Goldman Sachs affiliate Whitehall Street at the peak of the real estate market. The property declined in stature until it was sold back to KLS in 2010. KSL reportedly has plans to put millions into updating the rooms, golf courses and other facilities as they attempt to restore the greatness to the resort. The La Costa Resort and Spa underwent a complete $150-million renovation in 2007-09 that transformed the facility. 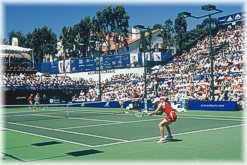 Besides two 18-hole PGA championship golf courses, guests and club members enjoy 23 tennis courts, three swimming pools, excellent restaurants, three lounges and a movie theater. Besides upgrading the existing amenities, the renovation added 14,000 square feet of luxury retail space and a 42,000 square-foot ballroom. A creative new La Costa real estate concept was also developed. 197 one, two and three-bedroom villas were built on the grounds of La Costa Resort and Spa. They were sold to individual owners, who can use them for up to 120 days per year. The rest of the year the villas are part of the rental pool of hotel rooms, effectively doubling the size of the resort to 446 rooms. La Costa is only minutes from fine dining, shopping and entertainment venues that are sure to satisfy all tastes. The Forum Shops in Carlsbad offer upscale shopping with popular restaurants. Search MLS data for La Costa real estate & La Costa homes for sale. The hills and canyons of La Costa offer a variety of private estates, luxury homes and condominiums. Many are second homes that offer getaways for people from around the world. Older homes and condominiums, many with golf course views, surround the La Costa Golf Course while new homes are being developed on the dwindling vacant land. On the highest hills of La Costa with distant views of the Pacific Ocean are The Estates of La Costa. These luxury custom homes are built on .5 to 2-acre sites. Homes are typically in the 3,000 to 5,000 square-foot size and sell for $1.5 million and up. The last of the original Rancho La Costa land holdings were developed into new master-planned, residential communities. 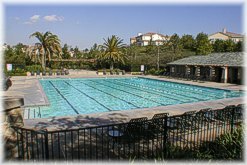 La Costa Valley was built-out in 2002 featuring parks, open space, walking trails, community recreation facilities and a day-care center for children. The last three communities, La Costa Greens, La Costa Oaks and La Costa Ridge offer new luxury La Costa real estate starting in the $800,000 - $1,500,000 range. Young families and retired people alike, are attracted to the casual lifestyle, convenient location and fine schools of the new La Costa neighborhoods. Search MLS data for La Costa real estate & La Costa homes for sale. Like the other areas of Carlsbad, La Costa schools share an excellent reputation for the education they provide. Younger children attend the Encinitas Union School District or the San Marcos Unified School District. And celebrating high achievement at all levels, the San Dieguito Union High School District serves the high school crowd. Fine private schools are conveniently located in the La Costa area. See more information below on La Costa schools or go to School Reports. If you want to buy a home in La Costa or if you already own a home in La Costa, protect your investment by looking at Real Estate Statistics. There, you can track the average sales price, days on the market, sale to list price ratios and more. Included are vital statistics, charts and graphs on La Costa real estate, shown on a monthly and annual basis. And, be sure to sign up for the free e-mail reports on La Costa real estate trends by going to Real Estate Trends. Want more information on La Costa real estate and homes for sale? Click here to contact Neal Hribar, your Berkshire Hathaway HomeServices, California Properties La Costa real estate agent. What homes are currently for sale in La Costa? Click here to do an instant search of La Costa real estate for sale.